The USA has lost a lot of manufacturing jobs over the past few decades and for a while the number of jobs was dropping drastically. But it now looks like in the past few years that the losses are leveling off. 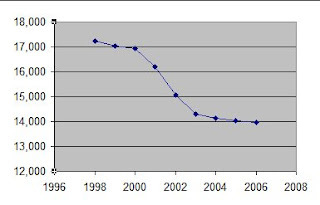 From 1998 to 2003 we had a -16.9% decline in manufacturing jobs or -3.7% annually. But then from 2003 to 2006 the decline in manufacturing jobs slowed to -2.3% or -0.7% annually. We all know that oil prices have skyrocketed over the past couple years. Gasoline prices have gone up drastically as well. So it should be no surprise that home heating oil has also jumped in price substantially. Natural gas prices are also on the rise. Across the nation natural gas is going up. The utility here is asking for a whopping 40% increase in their rates for natural gas. So what have the recent trends been in prices for heating oil, natural gas and electricity? Figures are in cents / kwh for electric, dollars per thousand cubic feed for natural gas and cents per gallon for heating oil. 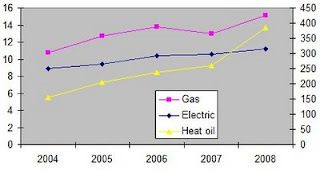 Source: Energy Information Administration short term energy outlook data. In that period, Natural gas increased 8.9% annually, electricity went up 5.9% annual and heating oil has jumped up 25.7% annually. Thats a 41% increase for gas, 26% increase for electricity and staggering 150% increase for heating oil in just 4 years. This type of data might come in handy if you are considering changing your home heating source. Electricity is the most stable price and that would be a benefit in going with an electric heat choice. If we look back at historical data for electricity we can see that electricity has increased an average of 3.65% annually from 1960 to 2007. I just saw a TV commercial for something called a Rex Agreement. Its a financial agreement where you get some equity out of your home in exchange for agreeing to give the company rights to a part of your homes future appreciation. Basically it works like this: You get money up front. In exchange for that the Rex company gets 50% of the appreciation in your home after its sold in the future. Here is an example: Say your home has $600,000 in total value right now. You can get about $71k in equity out of your house now. In exchange you promise the Rex company 50% of the future appreciation of the home. Once the current real estate downturn is over, it is pretty reasonable to expect average home appreciation of 4% in the long term. So 5 years later your home has gone up about 4% a year and is now worth $730k. The increase in appreciation is +$130k. 50% of that is yours to keep and the other 50% is kept by the Rex company. So you're paying $75k interest in 5 years for a $71k equity loan. That equates to about 15.5% interest rate. Ouch! That doesn't sound like a bargain to me, how about you? By comparison if you use a Home Equity Loan (HEL) instead your interest rate is going to be in the 7-8% range. If you borrow $71k in equity form your home from a HEL at 8% interest for 5 years you would be paying about $15,300 in interest versus $75,000 for the Rex agreement. To be fair I should point out that it is possible that your home may not increase in value over the next few years or it might go down in value. If this happens then the Rex agreement would be better for the borrower. However long term we can reasonably expect homes to appreciate so its most probable that the Rex agreement will not work out well. The Rex Agreement at first glance looks like a good deal. Its pitched as no payments and easy access to up front money. But the long term cost of the deal is not a good one. Stay away from a Rex agreement. If you need to draw equity in your home then a home equity loan or home equity line of credit is going to be a better choice. Bonds can be a little less straight forward to buy and sell than stocks. When shopping for bonds you can buy new issues or resold buy bonds on the market. Discount brokers deal in bonds and you can buy treasuries direct from the U.S. government. New bond issues have a price set at the face value and interest rate at the coupon rate. The bonds will have a specified time frame given as a maturity date. So for example you might see a new issue of bonds from ABC corp. with a coupon of 6.2 and maturity of 8/1/2018. That means the bonds will pay 6.2% interest for 10 years. ABC corp. will have a credit rating from the rating companies such as Moodies. Look for the letters such as AAA, A3, BB or similar. For resold bonds bought on the open market you are buying a bond from someone else who currently owns it but is now selling it. Bonds bought on the market have a price which is basically a % of the face value. So if the price listed is 95.45 then you are paying 95.45% of the face value. Because interest rates go up and down people are willing to pay a premium for some bonds or less than face value for other bonds. If ABC corp issued a bond this month at 6.2 and then interest rates go up significantly in the future then people won't be as willing to pay as much for the existing 6.2 rate bonds if they could instead buy other new bonds for more than 6.2 rate. Or on the other hand if interest rates go down in the future then new bonds sell with coupon of less than 6.2 then people will pay more for a bond with a higher existing coupon. Since the price varies the actual yield you get when buying a bond may differ from the coupon rate. For example if a bond is originally sold at face value with a coupon of 6 and then 3 years later interest rates have gone down then the bond might sell at a premium price of 114. Your immediate yield for that bond is 6 / 114 or 5.2. Since you are paying more than face value for the bond your actual interest return is less than the coupon rate. Corporate and municipal bonds can be bought via a broker. Charles Schwab, Fidelity, E*trade, ScottTrade all deal in bonds. The minimum purchase for bonds can be pretty high and the commission fees for the broker are not always obvious. You will pay a commission or fee for the bonds you buy. The fees are in the $30-50 range per bond purchase. Zions Direct charges $10.95 per bond purchase so they might be worth looking into (I haven't used them myself). Treasuries are a little simpler to buy. The treasury bonds are available to purchase direct from the US government. You can open an individual account at Treasury Direct and buy the bonds there online. I've been discussing bonds as individual investments. Buying individual bonds is much like buying individual stocks. With individual bonds or stocks your money is dependent on specific companies or institutions. If all your money is in a single bond or stock at that bond or stock fails then your money is in jeopardy. For this reason it is always good to spread your money around and diversify your investment. Bond funds offer a simple and easy way to invest in bonds and diversify your investment. Bond funds are managed mutual fund that invests in bonds. A bond fund will be a managed fund that is invested in a variety of bonds in a certain class. In general the key benefit of a bond fund is the diversification and ease of investing. If you have a smaller amount to invest and don't have the time or knowledge to delve into individual bonds then a bond fund might be an OK choice. On the other hand individual bonds will give you better return and have lower expenses. So if you have enough funds to diversify your bonds and can take the time and effort to fully understand what you're investing in then individual bonds are going to be the better option. Treasuries are a separate case. Treasuries carry virtually no risk of default and are relatively easy to understand and invest in. Therefore a treasury bond fund makes little sense compared to investing directly in individual treasuries. Bonds vs. Bond funds at SmartMoney. Bonds vs. Bond Funds at Forbes. Bonds vs. Bond Funds at Yahoo finance. Corporate and municipal bonds have credit ratings and there are general default levels for bonds of that rating class. Bonds with the highest AAA rating are very unlikely to fail and B rated bonds (Junk) are much more likely to fail. In the first two articles I discussed the a basic overview of bonds and an explanation of bond terms. Now I'll take a closer look at the different types of bonds. The main categories of bonds are Treasury, municipal, corporate and junk. Treasury bonds or 'treasuries' are issued by the U.S. federal government. As you may know the US government carries substantial debt and treasuries are one way they borrow money. Individuals can buy treasuries direct from the Treasury department. Treasuries are about the safest investment vehicle around and are backed by the full credit of the U.S. government. Due to the almost non existent level of risk in the investment treasuries have a relatively low interest rate. Municipal bonds or 'munis' are bonds issued by state or local governments. Local and state governments borrow money for a variety of projects: to build highways, fund schools, cover debts, etc. Munis are generally not taxable by federal or the state they are issued in. Municipal bonds have a very low default rate and so similar to treasuries they carry a relatively low interest rate. Bonds issued by corporations have a range of risk. Because the bonds are only backed by the credit worthiness of an individual corporation their risk is a bit higher and the interest rates are higher as well. Corporate bonds with very high risk are known as 'junk' bonds. These are corporate bonds with the worst credit ratings and the highest risk levels for corporate issuers. Due to the high risk of default you can get pretty high returns on junk bonds. Very low risk - Treasury bonds are good for very safe investment. Low risk and tax shelter - Muni's are good for a low risk investment with added tax benefits. If you have a high tax rate then munis can be especially attractive. If your tax rate is lower than munis are not as appealing. Low risk and moderate return - Corporate bonds with high credit ratings can be a good moderate return investment with a low risk level. In part #1 I discussed an overview of bonds. Now I'll explain many of the key terms used to discuss bonds. Maturity - The date when the bond is finished. Callable - A bond is callable if the issuer can repay it early. Coupon - This is the interest rate that is paid on the face value of the bond. Face value - The principal in the bond. The value that the bond is bought at originally. Zero coupon - A bond without periodic interest payments or a 0% coupon. For this kind of bond the interest is paid at maturity. For example you might buy a bond for $50 and then get $100 in return years later at maturity. Price - The price is the amount that the bond is currently traded for. Price is expressed as a fraction of 100 to represent a percent of the face value. So if the price is 99.1 then the bond is trading at 99.1% of the face value. Bonds are an investment vehicle where by you lend money to someone for a promise that they will pay you back with interest. What kind of investment are they? When should you use them? Generally speaking bonds earn medium to low interest rates and have fairly low risk level. Bonds safer and less volatile than the stock market but a bit more risky and less liquid than saving in a bank or CD. Bonds are a good place to put money that you need to keep safe for a few years. If you are nearing retirement for example than bonds are a pretty good investment. Bonds are issued for a set period of time given in years. Bonds come in various terms from a fraction of a year to 40 years. You buy the bond for a specific price, typically increments of $1000. The bond issuer will then pay the bond owner interest at specified intervals during the period of the bond. Then when the bond period is done and the bond 'matures' the issuer will return the principal face value to the bond owner. Bonds fall into 3 main categories: treasury bonds, municipal bonds and corporate bonds. Treasury bonds are issued by the US government and are one of if not the safest investment in the world. Municipal bonds or 'munis' are issued by state and local governments and are typically tax free. Corporate bonds are issued by companies to generate capital. Junk bonds or speculative grade bonds are a type of corporate bonds with high risk of default. What are bond ratings about? Bonds have ratings that indicate the quality of the risk. 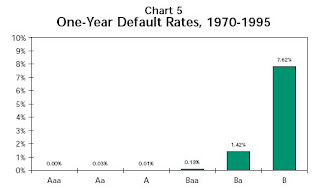 The better the rating the lower the risk of default. Bond ratings are like grades of A, B, C, So an A rating is better than a B rating. Main organizations that rate bonds are Moodys and Standard and Poors and Fitch. Moodys rates bonds as : Aaa, Aa, A, Bbb, Bb, B, Ccc, Cc, C. S & P and Fitch use AAA, AA, A, BBB, BB, B, CCC, CC, C. Anything below Bbb/ BBB should be avoided and is considered a 'junk' rating bond. How do you buy/sell bonds? You can buy treasury bonds directly from the US government. Other bonds can be bought and sold through a broker such as Scottrade or Charles Schwab. Glossary of bond terms at Bonddesk. Do you have a frequent coffee habit? If you visit Starbucks or other espresso stands frequently then you could easily be spending $3 to $5 a day on coffee. Consider buying an espresso machine for use in your home. Amazon has a variety of espresso machines for a range of prices. Smaller units start under $60. If you get a book such as Cappuccino/Espresso: The Book of Beverages from your library or on sale used then you can get some recipes for your favorite coffee drinks too. Or you can scour the web for recipes and guides like How to Make Your Own Cappuccino at home or The Perfect Home Cappuccino. The cost of making the coffee at home will be pretty minimal and should be less than a dollar. For a cappuccino you might spend 20-40¢ in milk and maybe another 25¢ in coffee. So your total costs to make a cup at home are in the ballpark of $0.50 per cup versus $3 to $5 at a coffee stand. Lets say you paid $100 for an espresso machine and a book and supplies and ended up spending $150 total. If you get coffees daily before work for just $3 each at an espresso stand then it would only take 3 months or so to pay back that in initial cost. In one year you could save yourself $450 by buying a maker and doing it at home versus buying coffee daily before work. Some of our hobbies can be pretty expensive. Golf comes instantly to mind. About 26 million Americans spend $24 billion a year on equipment and golf course fees. The average golfer spends over $900 per year on their hobby. Snow skiing can also be expensive. There are 10 million skiers in the US who spend over $4 billion a year. Thats an average of $400 per year for skiing. A movie buff who buys just 1 movie on DVD a month could easily spend over $500 a year. With us spending $400, $500 or $900 on single hobbies the expenses can add up. If your money is tight or you're trying to cut expenses to save more then cutting down on hobby expenses can have a real impact. There are two main tactics I'd use to cut hobby expenses. 1) cut back or reduce costs on your expensive hobbies. 2) add or increase your enjoyment of less expensive hobbies. Do it less often: Instead of going for a round of golf every week go twice a month. Find suitable alternatives: Try cross country skiing instead of downhill to save on lift tickets, go to the driving range instead of playing 18 holes or use Netflix instead of buying DVDs. Cut equipment costs: Buy used equipment. Don't upgrade equipment as often. Its fun to have a variety of hobbies. The more time we spend on cheap or free hobbies then the less time we're going to spend on our more expensive hobbies. Reading: You can get books for free at the library. Playing cards: Most of us already have a deck of cards but if we dont' then you can probably buy one for a dollar. Or you can play online at Yahoo. Biking: Once you own a bike the rest is free. You can purchase a used bike to cut down on equipment costs. Online video games: There are a lot of free games at Yahoo. Gaming: A board game like Monopoly costs around $14 and can provide endless hours of fun. Or see my previous post for cheap games under $10. I've often wondered how people in California can afford housing there. Housing in California costs significantly more than surrounding states and the income levels there doesn't make up for the difference. I'll compare the affordability of living in 4 major cities Los Angeles, Seattle, Denver and Las Vegas. We'll do the comparison for three example professions: real estate appraiser, middle school teacher and electrician. For the sake of example lets assume that you have the option of working in 4 different cities and a job is readily available in each. So now we know how much money people make for these jobs in the cities and we know how expensive the cities in question are to live and buy homes. This gives us basic data to compare income versus expenses. One simple way to compare the affordability for each profession between cities would be to simply divide the income by the COL. Another way is to estimate how much home people can afford given their salary and compare it as a % of median home costs. I'll use both of these methods to compare the 4 cities for each profession. By either measure a real estate appraiser would have more spending power if they lived in Las Vegas. Seattle is less affordable for this profession given their income there. I'm a little surprised that for this specific profession if you were just comparing living in Seattle or Los Angeles then L.A would be the cheaper option! Middle school teachers fare best in Denver by either measure. Then the most affordable are Vegas, Seattle and L.A. in order. Electricians do best in Vegas and then Denver, Seattle and L.A. Overall we can make some general conclusions. L.A. is usually the most expensive place to live among these four cities. This should be no surprise given the high cost of housing there. Las Vegas and Denver are both reasonably affordable. Seattle falls somewhere in the middle of affordability. If I expanded the comparison to other parts of the country and other cities of varying sizes then we would see a variety of results. Depending on the profession in question you might do best in Fargo, Austin, Atlanta or Boise. Of course there is more to choosing your place of residence than the pay levels and the affordability of housing. I'd rather share a studio apartment in Los Vegas than own a mansion in Siberia. Each of us has our own set of priorities that determine where we'd want to live. Proximity to family, climate and availability of entertainment options are all factors that would typically play a part in choosing where we might want to live. 2. Use the BLS site to look up salary levels for your profession in those cities. 3. Find the COL and median home prices from sources such as Sperling or Realtor.org as linked to above. 4. Compare income versus costs for each city and find the cities that give you the best pay versus costs. Moving is not something that I'd do on a whim of course. I'm not suggesting that people should crunch some numbers and then pack up the family tomorrow and drive across country because you might have 5% more income or purchasing power. Moving is a major change in your life. For those of us who own homes and have roots in a community it can be a difficult thing. But it is worth comparing the options in different locations over the long term. You might find that simply moving 100 or 200 miles from one city to another in your own state might save you significant amount and/ or increase your income considerably. How expensive of a home should you shop for? I have a friend who is shopping for a home right now. One of the first big things you ought to do when shopping for a home is to set your home budget. You don't want to go looking for homes without knowing how much you can afford. You should also get prequalified for a mortgage so you know you've got your loan all setup in advance. So a big question to answer is : exactly how expensive of a home should you buy?? So for example if you make $60,000 a year and you've got $20k saved for a down payment then shop for a house that costs $170k or less. Then I divide that by 12 to figure the monthly payment. Then I estimate the amount of home you can buy with a given monthly payment. Since the interest rate, insurance and property tax amounts aren't fixed we have to ballpark this value. I used a mortgage calculator and came up with ranges in the neighborhood of $105 to $135. I picked 2.5 to fall within that range. To figure a more exact amount: Start with your monthly payment budget by using 25% of your gross salary. Then you'll need to figure out exactly how much loan that will get you. First you need to know the interest rate for a loan. Today 30 year fixed loans are going for 6.0 to 6.5% range. But the rates go up and down on a daily basis. Second you should have an idea of the property tax rates in the area as a percent of property value. Third find out what insurance will run in your area. Once you know the loan rate, tax rate and insurance rate you can use a mortgage calculator to find out how much of a loan you can afford given your monthly payment budget. How Much Can you Afford? from Motley Fool. RewardsGold has an offer right now where they are giving out free 1 year subscriptions to Wired magazine. To get the subscription you have to fill out a survey, register with them and refer a friend. I like Wired so I went ahead and did it. But if you don't want to register and share your info with a 3rd party like this then you might want to pass. 55 MPH to save fuel? Recently US Senator John Warner suggested we return to a 55MPH national speed limit in order to save gas. Would 55 MPH speed limit really save us gas? If so then how much? The CNN article cited study that said 55 MPH would save 2% in national gas usage. Its certainly true that lower high speeds will save gas. This article testing MPG versus MPH on metrompg.com has a number of graphs showing fuel usage at highway speeds. In every example the MPG dropped off fairly steeply compared to the MPH. New cars are not somehow miraculously more efficient to get better mileage at high speeds. The EPA graph shows a 20% increase in mileage dropping from 65MPH to 55MPH and the other graphs show mileage improvements in similar ballpark. So it is true that mileage improves at 55MPH in general. But while we would save gas is it going to save us overall? What are the other costs of a lowered 55 MPH national speed limit?? There are in fact other costs to a 55 MPH speed limit. Lower speed limit takes more travel time which costs money. If you drop from 65 MPH down to 55 MPH then a 500 mile trip will take 9 hours, 5 minutes instead of 7 hours, 40 minutes. If your car gets 30MPG at 55MPH and 25 MPG at 65MPH then you'd save about 3.33 gallons of gasoline. At $4 / gallon that is a $13.33 savings for the 500 mile trip. But your spending an extra 85 minutes on the road to save that $13.33. The 85 minutes is worth around $8.28 at minimum wage. It costs money to enforce a 55 MPH speed limit. The states will have to spend more on highway patrols to enforce the new speed limit. I think there are better, more cost effective ways to lower our oil consumption. The other day a relative of mine told me about a device he had heard of that was supposed to increase your cars fuel economy. Someone had told him that it more than doubled their cars MPG. There were even supposed to be tax incentives available from the IRS for purchasing this miraculous invention. The story sounded fishy to me so I looked into it. Sure enough its basically just a scam. With most things if something sounds too good to be true then it usually is. With the price of gas nowadays I'm sure that we'll see a lot more of these types of devices being advertised but they are nothing new. There are additives, 'vortex' devices that you put in your air intake, magnets you attach to the fuel line, and even jars of water that are all supposed increase your fuel economy. Bankrate.com examined the topic in their article Gas Saving Devices mostly a scam. Bankrate points out that the EPA has a page full of reports they've done on gas saving devices or additives and almost all of them have not lived up to their promises of gas savings. They also point to a Popular Mechanics article Looking for a Miracle: We test automotive 'fuel savers'. Some of the devices Popular Mechanics tested reduced horsepower and increased fuel usage. Alarmingly Popular Mechanics even saw a device cause damage a car to catch on fire! Its common to see these wonder inventions marketed along with claims that the technology is suppressed by the oil companies and car companies. I guess the idea is that this miracle cure is so good that the evil companies just don't want you to have it. But if improved fuel economy was as easy as clamping a magnet to your fuel system or putting a slightly different air intake on the car then the car makers would be doing it themselves and all bragging about the fuel savings. Stay away from these gizmos and gimmicks. They are almost all assuredly scams and you'll only end up wasting your money on them. Previously I wrote about Saving at restaurants #2- birthday & email club discounts In that article I talked about joining clubs at restaurants that give you freebies for your birthday. McCormick and Schmick : Free dinner entrée up to $40. I got this one as part of their rewards club. It came in postal mail and I think they mailed it 1-2 weeks before my birthday and it was good for 6 months. Black Angus : Free steak dinner up to $18.99 with an entrée. They sent it about 2 weeks before my birthday and its valid for 30 days. Red Lobster : $5 off of two dinner entrées. They sent it a week before my birthday. You have to go to their website to print it out. I think it expires 2 weeks after you print it. Buffalo Wild Wings: One free desert with a $5 purchase. They sent it a week before my birthday and it expired a week after my birthday. The meal at Mccormicks and the free steak at Black Angus are both good deals. The other offers are kinda wimpy in my opinion. If you're considering these type of deals keep in mind what your total costs are and make sure you're not over spending to try and get a bargain. Getting a free entrée at McCormicks is a high value freebie but the overall check might be much more than other restaurants. For example : two entrées, two salads, two drinks and two deserts at McCormicks could easily run you around to $80 or $90-95 with a tip. Even if with one of the entrée's is free you'd still end up spending $60-70. By comparison if using Restaurant.com gift certificates I can get a similar meal for two down to $40-55 range at our local steak house. I happen to love McCormicks so I'll pay a bit more to eat there and saving money when doing so helps. But you ought to make sure you know what you're spending with and without freebies. Also if you're going to use free deals like this then try to maximize your value. Order the most expensive item you can get up to their maximum. If you're dining with someone else then try and get items of similar value so you don't get a cheap item for free and pay for an expensive item. This is a review of Investing for Dummies by Eric Tyson. I have the 2nd edition copy dated 1999. They are now on the 4th edition and a 5th edition is due out soon. When I reviewed Small Business for Dummies I commented that I like the Dummies series. Reading a Dummies book doesn't mean you're literally a dummy but its just a conscious admission that you have more to learn on a topic. Investing for Dummies is by the same guy that wrote Small Business for Dummies. 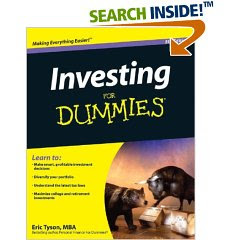 He covers overview and basics of investing as a Dummies book typically handles a topic. Topics include overview of different types of investments, discussion of risks and rewards, stocks, bonds, mutual funds, real estate and small businesses. The book does a good job of pointing out things to avoid and giving tips on various topics. The books strength is that it covers a broad amount of information on investing from the bottom up. If you're brand new to investing or just know a little then Investing for Dummies is sure to have some valuable information for you. Here is an interesting tidbit: When discussing risks in investing he points out that 8 times from 1890 to 1999 there were plunges in the stockmarket that 40% or more over 2-5 year periods. I'd recommend getting a copy of Investing for Dummies if you are new to investing. I'd recommend looking for a more recent version than the one I have since it has gotten a little out of date. Look for the book in your local library or thrift stores. Reusable grocery bags are a good buy. I while ago our grocery stores started marketing and selling reusable cloth bags. They generally sell for about $1 each. They are large sturdy bags that easily replace the standard paper or plastic grocery bags. Plus our grocery store gives us 5¢ off for each bag we use. If you go to the grocery store about weekly you're saving about $2.50 a year for a $1 purchase. That's a 250% return on your money in a year. The only downside is that I occasionally forget the bags, so I just keep them in my car. The myFICO site has a Free FICO® Credit Score Estimator [removed dead link] page that will estimate your FICO score. Of course it doesn't replace getting your actual FICO score but if you don't have a specific need to know your FICO then using the estimator isn't a bad idea. I would assume that the estimator would probably place your score in the right ballpark given that you provide it correct information. Previously I discussed the financial feasibility of installing solar panels to provide electricity to your home. From a comment by 99k on Free Money Finance article I heard about a company named Citizenrē They are a startup that plans to rent solar panels to homeowners at a fixed cost. You'd buy the electricity from them below your current electric rate and the cost would be fixed. They have 1, 5 and 25 year term agreements. Its an interesting idea but the Citizenre site is pretty skimpy on specifics as far as price and it doesn't appear they're actually installing systems yet. SO I guess we'll have to wait and see if it actually happens or not. Now thru 7/13, Take 50% off $25 Gift Certificates. Pay $5 when you use the code DELICIOUS. Money merge account - not a good idea. Recently a friend sent me an email about a "money merge account" from a company named United First Financial. My friends email said the account would help you pay off your 30 year mortgage in 7-10 years simply by using a home equity line of credit (HELOC) and without changing your own spending habits. It seemed too good to be true and I think it is. At best its just a way to shuffle money around a little to save some interest combined with prepaying principal on your mortgage. At worst its a fraudulent scam. Basically in a nutshell they have you open a HELOC and then use that to fund your mortgage. They then have you deposit your paycheck into the HELOC and then pay your bills by drawing on the HELOC. Net result is you save mortgage interest on the amount of your paycheck over the month less what you draw out for your bills. "Assume the borrower’s monthly paycheck is $8,000, and on the first day of the month he does the following: a) Draws $8,000 on his HELOC which is used immediately to reduce his mortgage balance, and b) applies his paycheck of $8,000 to pay down the HELOC. On day 2, therefore, his HELOC balance is zero and his mortgage balance is lower by $8,000. As the month progresses, he pays his expenses by drawing on the HELOC, and the HELOC balance gradually rises to $8,000. However, the average balance will only be about $4,000. For the month as a whole, therefore, he has saved interest on $8,000 of the mortgage while incurring interest on $4,000 of the HELOC. Assuming both are priced at 6%, he has saved $4,000 x .06/12, or $20. Over a year, that adds to $240. Of course, if the paycheck is $16,000 instead of $8,000, the number will be $480, and if the paycheck is $4,000 the number will be $120." $20 savings a month is a good thing of course, but you could just put your $8000 into a high yield savings account at 3% and earn $10 on it instead. Furthermore you'd probably have to pay fees and setup costs for your HELOC and there is no guarantee the HELOC rate won't go up considerably in the future. If you were putting $20 extra a month into your mortgage it would pay off a 30 year mortgage about 1 year quicker. So how does the money merge account pay off a 30 year mortgage in just 7-10 years?! The money merge account also has you put all your extra savings into the mortgage. Anything you don't spend out of your pay stays in the HELOC. There is no trick to paying more towards your principal and the website my friends email pointed to wasn't that up front about this being the main way the mortgage is paid off quicker. The worst thing I found about the money merge account is that they want to charge you $3500 up front for it. In my opinion that price seems like a ripoff for something like this. Instead of paying a company $3500 for what amounts to a money software program, I'd instead just put that $3500 into your mortgage principle. Doing so would probably cut a year off your mortgage. I'd stay away from this money merge account or similar schemes. If you're interested in paying off your mortgage quicker then I'd recommend simply increasing your monthly payment. Is a Money Merge Account a Good Way to Pay Off Your Mortgage? Money Merge Accounts: Good Fairy or Demon? The UFF Plan: Another good fairy of rapid payoff? Don't Get Tricked by Equity Accelerators Interest Cancellation, Merge Accountsor other Financial VOODOO! Not all prices are going up. The Bureau of Labor Statistics (BLS) reports that May inflation is up +4.2% from last year. With the cost of gas going through the roof lately and the grocery bill rising as well it is easy to see first hand that many prices are going up. But while some prices are certainly going up a lot, not everything is increasing in price. The full CPI report with the increases for each category is posted here. Of course this doesn't help the sting of spending $100 to fill up your cars gas tank but I just wanted to point out that its not ALL bad. I saw this device called an ooma hub advertised on Amazon recently. The company ooma makes a device called the ooma hub that works with your broadband internet to give you free home phone service. It costs about $250 to buy the system. Thats a decent price compared to a monthly cost for phone service via the phone company or internet VOIP companies like Vonage. The ooma device supports free long distance within the US and has built in caller ID, call waiting and voicemail. Its a simple box that hooks up straight to our broadband internet and then connects to your standard phone. Another nice feature of the ooma device is that you can use it together with a basic landline from your local phone company. The benefit to keeping a local landline is that it will still give you 911 emergency service and you don't have to get a new phone number. Using a landline and a VOIP would seem to defeat the purpose of using VOIP, but doing so can help you save costs on your landline by discontinuing extra features. Right now my standard phone bill is about $40 a month but about half of that, $20, is for the expanded features and long distance service charge. So I could feasibly get the ooma hub and connect it to my normal landline phone and then cut back my phone services to the bare minimum. The ooma would pay for itself within a year and give me free long distance too boot. If you use a ooma instead of a standard phone line or a VOIP service such as Vonage then the savings in monthly fees should pay for the initial cost of the ooma box within a year or so. I haven't used an ooma myself but the reviews on Amazon appear pretty positive. Both my uncle and one of my friends have wood pellet stoves to heat their homes. Wood pellet stoves are basically just wood stoves that burn small pellets made of wood. The pellets are sold in bags and you dump them into the stove which then burns the pellets as needed over time to provide heat for your home. Last winter my friend told me he uses about 1 bag of pellets a day and the bags run him $4 each. Thats about $120 in heating costs a month and he lives in a fairly cold area and has a decent size home. The Pellet Fuels Institute has a calculator to compare the costs of wood pellets versus other forms of heat. In general wood pellets are less expensive than oil, electric or propane. Natural gas is of comparable cost to wood pellets. Burning hardwood or coal are both cheaper than wood pellets. If you live in an area that gets cold in the winter and wood pellet stoves are available in the market then you might want to look into one. Natural gas heat might be the cheapest option overall, but if gas isn't available then wood pellets might work well for you. If you think about wood pellet stoves at all then I'd look first to see if wood pellet stoves and the pellets themselves are readily available in your area. If you can't buy the wood pellets locally then using a wood pellet stove becomes pretty impractical. Is installing residential wind power financially practical? I personally think that wind power is a great idea. It has a fixed cost, theres no dependence on a foregin producer and it is environmentally friendly. In recent years wind power has become pretty practical economically. Wind power installations are growing pretty fast nationally. Most wind power is in the form of giant windmills built by electric utilities. These are out in remote areas with substantial amounts of wind and cost in the range of $1 million each to make. But small wind turbines can also be bought and installed at residences and farms. Individuals can use wind to supplement their own power needs. But is a small wind turbine a practical financial choice? The U.S. Department of Energy has a site about small wind installations for consumers. The guide has a lot of information and it covers the topic well. The initial cost of the small wind installation. Wind is probably not practical for >80% of U.S. residential customers due to lack of wind, lack of land or because of zoning limits. But if you live in an area with substantial wind, have some acreage then it might be worth investigating. I'd keep in mind however that costs for small wind installations run $3000 and up to $50,000. Is solar power financially practical? I've looked at solar power before to see if it might be practical to install solar panels at my own home and have it provide some of my homes electricity. There is a website Find Solar that has information on home solar installations. From that site they have a 'My Solar Estimator' calculator that will help you estimate the cost of a solar system including the tax benefits and rebates for your location. It will also figure how much you save per month in electric utility costs. I used the calculator myself and found that to replace 50% of my electricity usage that I'd need to get a solar system costing $X after credits. Financing that long term would cost about $X per month and it should save me about $75 per month. However if I were to scale back to a 10% system it would cost about $17000 total and after credits I'd only pay about $7500. I could finance that for $50 a month and save $15 a month on electricity. However over the years the electricity savings would increase and probably get up to the $20-40 range per month. If you also figure that the solar system would add value to the house then this kind of installation is almost practical. If you live in a very sunny location then solar might be a better option. But overall I don't think that solar is a good financial choice right now. Mainly since there are better ways to spend money to save on energy. MSN has an article Service Lets drivers lock in gasoline prices about a service called MyGallons.com. I took a look at the MyGallons.com website. It seems they basically just let you prepay for gasoline and then you use a special credit card to buy the gas later. The service costs $30 a year to sign up. If we assume that gasoline is going up then this is a pretty sweet deal. You could have saved a lot of money if you had this service a couple years ago and bought a lot of gas at $3 or less. But there is always the risk that gas may go back down some in the future. If you think gas is going to keep going up then it might be worth looking at. MyGallons is a novel idea if nothing else. If you fly somewhere and need to rent a car you will typically rent the car at the airport. But the airport location may in some cases be significantly more expensive to rent a car. I've seen this discussed a couple places lately, for example Five Cent Nickel mentions it in their post The Hidden Costs of Renting a Car. I decided to do a quick check of some prices on Enterprise to see how prices differ by location in the same city. I checked the airport rate versus non-airport for a weekend rental in my home town over August 14-17. At the airport the cost was $200.99 total and at a non-airport location 6 miles from the airport the cost was $137.84. So that's $63.15 cheaper to rent at the non-airport location. Then I checked a weekend trip to Vegas for September 25-28. At the airport the cost was $99.56 total and at a non-airport location about 2 miles from the airport it was $166.41. In this case its cheaper to rent at the airport by $66.85. Saving about $60 bucks on a car rental seems like a good deal but if you're traveling you'll have to get yourself to the non-airport location. That might mean a taxi drive for $10, $20 or more. You should also check if you can rent the car at a cheaper location and then drop it off at the airport on the return for the same fee. The lesson to be learned here is that you might save a decent amount of money by shopping around for rates at different car rental locations at your travel destination especially for longer trips.